Definately good news to a certain extent. 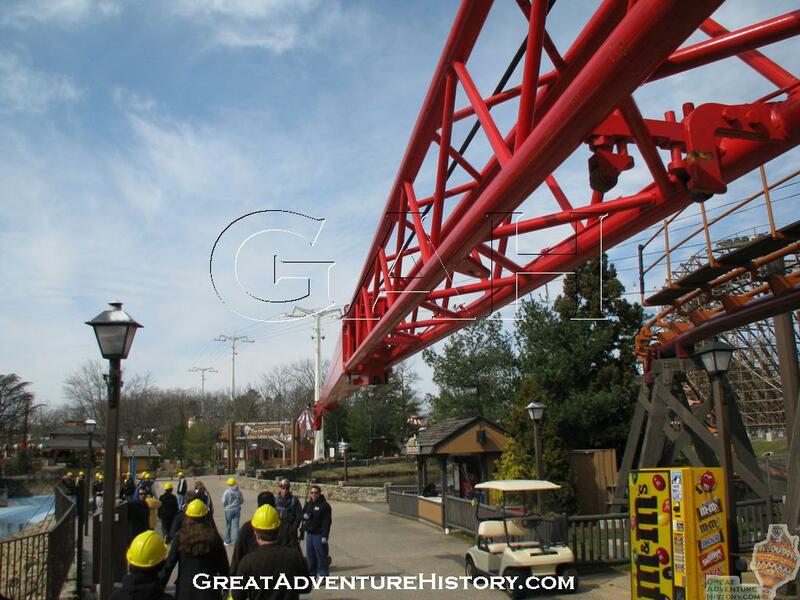 WHo knows maybe next off season instead of a major new attraction such as those we have gotten recently with Kingda Ka, El Toro, TDK, Wiggles World, etc. the park will be able to free up some money for the good old Super Teepee even if just to preserve it for the near future. I think I woud take a year without a major new attraction in order to save a wonderful part of our park. BAD NEWS: We have heard from several reliable sources that the Super Teepee suffered extreme damage over the weekend when high winds and pouring rains belted NJ. The Teepee was stripped of its outer skin and the wooden log support structure may have also been damaged. This is definitly bad news as we were all hoping the Super Teepee would be refurbished in the near future and continue to dominate the Best of the West skyline. Oh No that is really disturbing news. Weather must have either been really bad down in Jackson or the damage the Teepee had suffered before now was pretty extensive because the storms didn't seem as bad as many of the ones the structure had to have endured in the past. While I am disheartened to hear about this new turn of events, perhaps it serves to show that the company was very proactive in shutting the Teepee down to guest interaction before something like this happened while people were inside. Afterall, if the Teepee were open and a large storm hit the park, many patrons in that area would probably head there first to avoid the winds and rain. This leaves two options for the park that have to happen before the park opens. One (which I hope happens) is that they go all out and give it a great refurbishment (Or at least get it safe enough for guests to go near when the park is open so they can have more time for repairs). The not-so-good option is to pull the plug on it and take it all down. Unfortunately recent trends at the park say the second option seems more realistic nowadays. 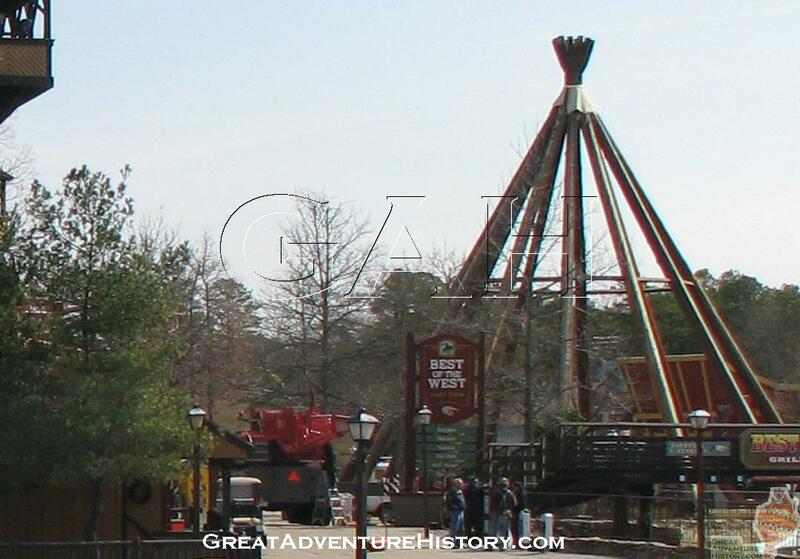 Although I am sure the company realizes just what a huge part of the park's history the Teepee represents due to how long it has been in existance. If not they probably would have pulled the plug a while ago. That's a very good point about it being closed last season. I know I have spent many thunderstorms taking shelter inside the Super Teepee. I use to love the sound of the rain hitting the canvas. Usually the smell of "GA Air Conditioning" and the humidity right around the storm always made for a pleasant rest and a chance to see what new western treasures were for sale. Man, I hope they restore it. Maybe the insurance money will fund a brand new skin ! The storm was pretty bad where I am. Blew the car cover off of my car and I had bricks weighing it down! So with a tent like Super TeePee the storm would have been real bad for it. I think the best thing to do with the log frame being rotted anyway is to tear it down and rebuild it. Build a steel frame with a fake log cover. But I doubt the park will do that. I hope they don't tear down the TeePee for good but sticking the huge logs that make up it's frame in the ground was not wise. 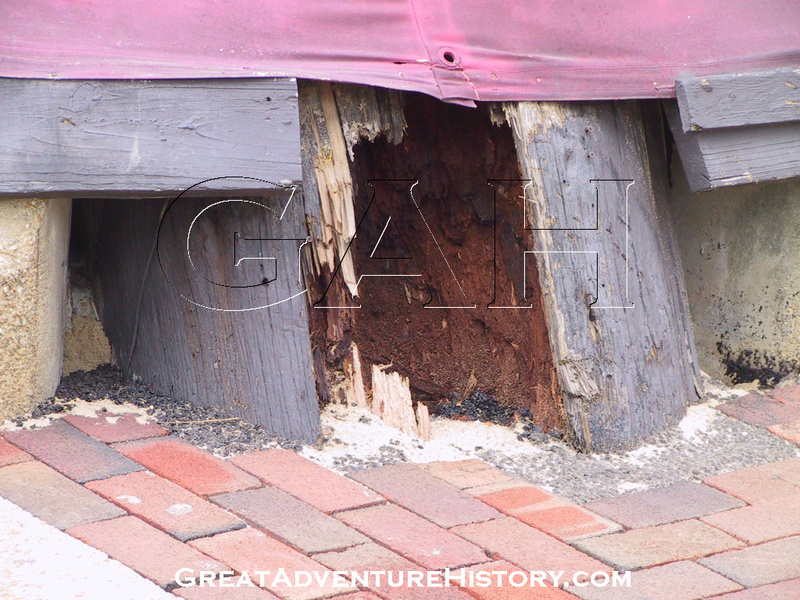 Northeast woods are full of termites and carpenter ants that will eat wood that is in the ground. Besides the bugs NJ is so wet any wood in the ground would rot. It would have been better had they back in the 70s poured concrete footings with metal brackets and bolted the logs on top of them to prevent wood contact with the ground which really helps to prevent rot. If Phil plans on doing another fly-over soon, we should see if he can snap us a shot of the structure. How hard is it to get a new skin for the Teepee? Since it has been basically stripped off like a blanket on a bed, is it possible to get a new one? It is a shame for it is such a landmark to me for our great park. The skin is the easy (and less expensive) part. The real cost comes in when they have to replace one or more of the logs which basically are the support structure of the Teepee. Don't forget, we can only see the damage at ground level where the logs touch the earth. There could be additional damage on the top ends of the logs where they all meet under the central cap. Obviously, water runs down and odds are it has taken its toll on the other end of the logs too which is much more dangerous. Here's a picture of the Super Teepee taken this morning on a park construction tour. The Super Teepee will not be repaired or replaced and the remaining sturcture seen in this photo should be removed before opening day. Click HERE for additional photos of the damaged Super Teepee. If they keep this up they will have to rename the park Great Empty. 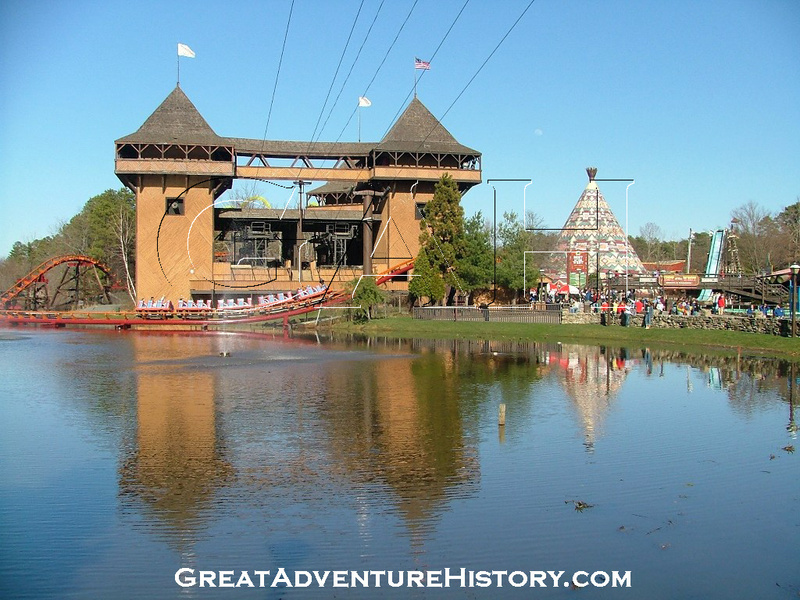 With the Teepee now officially gone, it does open up another area for a brand new flat ride. It's footprint would be a good place for a new addition of some sort one day if a new Teepee is not ever in the plans. An unfortunate new addition to our Then & Now photo collection. ^More like a then and during picture. Opening day is Then and Now, ahaha. 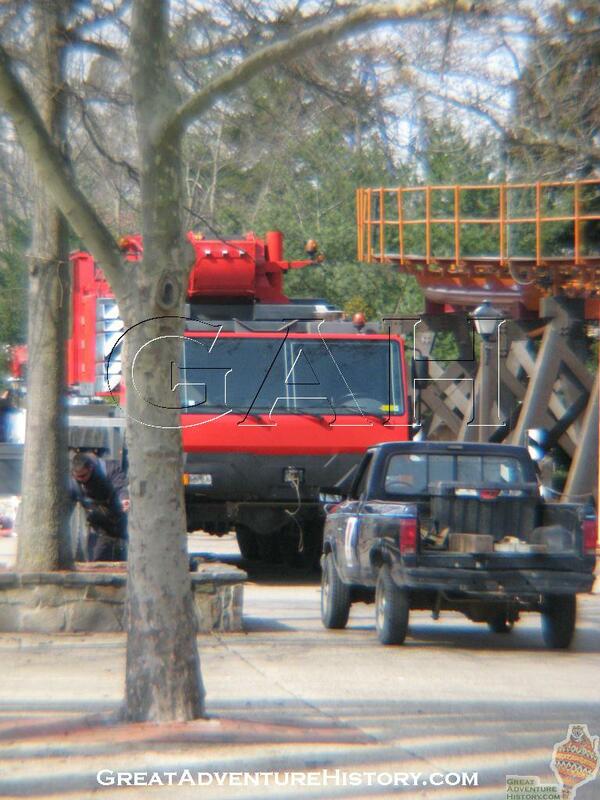 A crane in the Best of the West- I wonder what this is could be for? The Best of the West surely seems to be lacking something without the colorful Teepee. 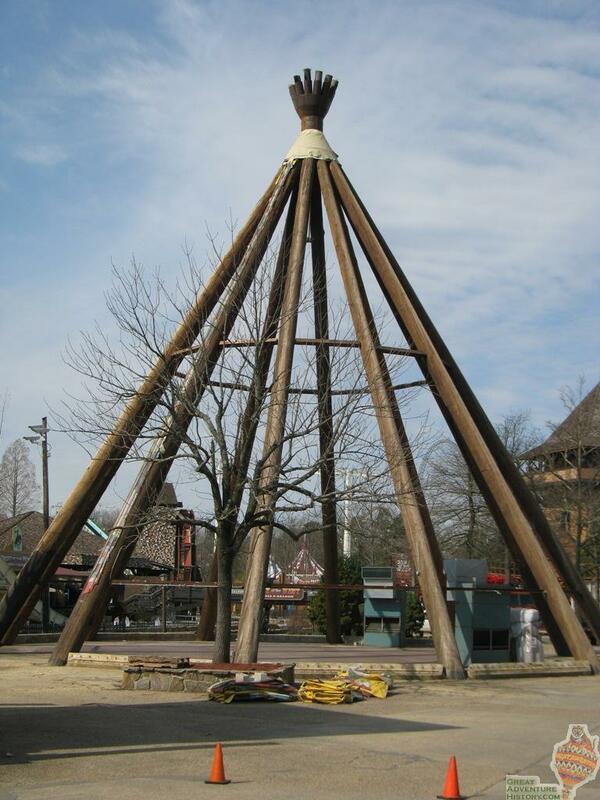 The park should salvage the strongest log out of the bunch and have it carved into a totem pole which could stand near the old Super Teepee site. 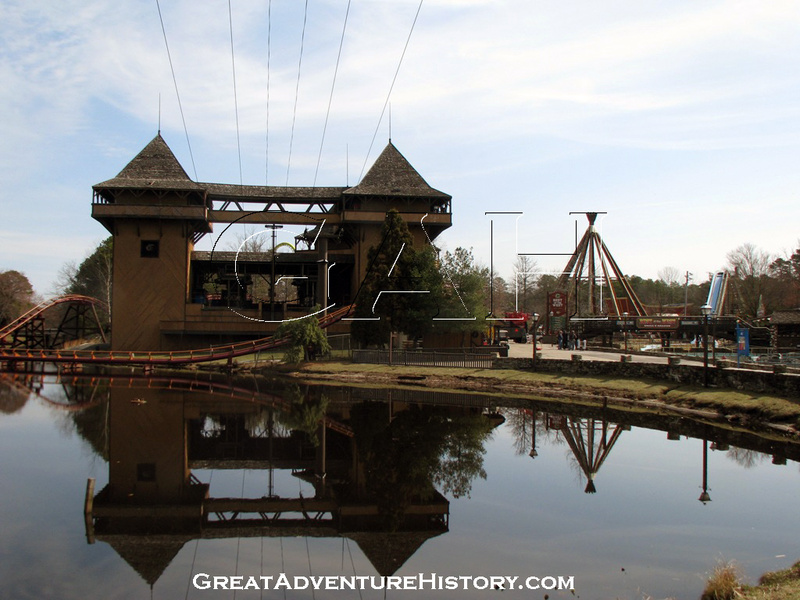 It would add to the theming of the area while at the same time pay tribute to this lost landmark.